For many budding Gamestormers, one of the trickiest challenges isn’t in running the games, but in sequencing them to get to a specific outcome for a meeting. This template should help you think through the process of organizing games to evaluate where a certain game path may take you. 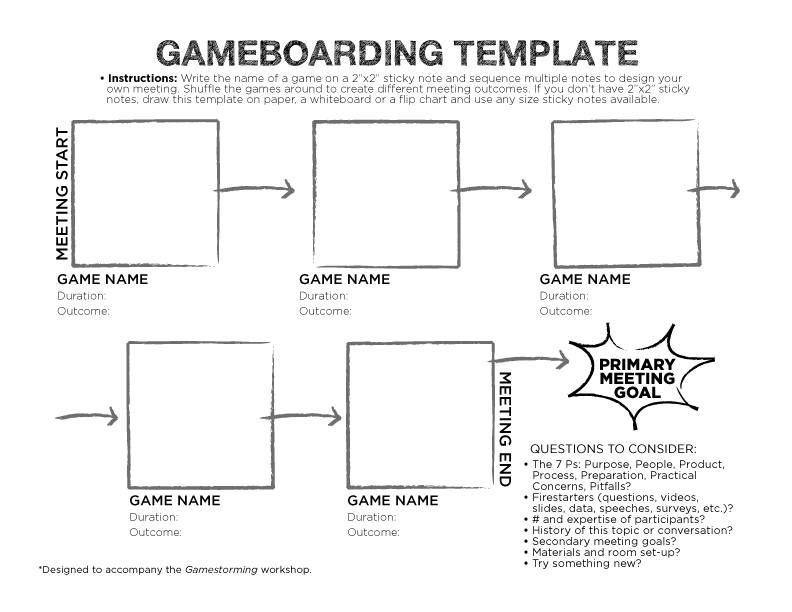 It’s called Gameboarding because it’s akin to Storyboarding – shuffling and reordering content until it creates a meaningful arc. Keep in mind that a good meeting is organized around a meta-structure of opening, exploring and closing, and also involves an awareness of the micro-structure of that same process embedded within each game. Ideally your session will be designed around this (often referred to as diverging, navigating and converging), while driving toward your primary meeting goal.